AAC has been standardized by ISO and IEC, as part of the MPEG-2 and MPEG-4 specifications. The MPEG-2 standard contains several audio coding methods, including the MP3 coding scheme. AAC is able to include 48 full-bandwidth (up to 96 kHz) audio channels in one stream plus 16 low frequency effects channels, up to 16 "coupling" or dialog channels, and up to 16 data streams. The quality of stereo is satisfactory to modest requirements at 96 kbps in joint stereo mode; however, hi-fi transparency demands data rates of at least 128 kbps (VBR). The MPEG-2 audio tests shows that AAC meets the requirements referred to as "transparent" for the ITU at 128 kbps for stereo and 320 kbps for 5.1 audio. 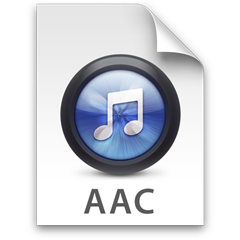 Like MP3, AAC is a lossy format, meaning that in order to compress CD-quality audio files into smaller files suitable for transmission over the Internet, some data that will not impact the listening experience of the file is removed. As a result of the compression, though, AAC files do not sound identical to CD-quality files. Like MP3s, the quality of an AAC file is measured based on its bit rate, rendered as kbps. Also like MP3, common bit rates for AAC files include 128 kbps, 192 kbps, and 256 kbps. The reasons that AAC files produce better sounding files at the same size than MP3s are very complex. If interested, you can read the Wikipedia article on AAC to learn more details about this. Macgo Mac Blu-ray Player: Play AAC format on your Mac. Macgo Windows Blu-ray Player: Play AAC on Windows platforms. Macgo Free Mac Media Player: Play AAC for Mac OS X. Advanced Audio Coding on Wikipedia.